Apollo’s Hegemony Magnesium Malate is a dietary supplement containing the best assimilable magnesium in the organic form of magnesium malate, which is the combination of magnesium and malic acid. Malic acid is the component naturally occurring in the organism and included in the composition of enzymes taking part in ATP synthesis, thanks to which it is distinguished by high bioavailability and also supports energy production in the organism. The preparation positively influences motor and mental abilities, decreases the feeling of fatigue, supports mineral balance of bones, carbohydrate metabolism and strengthens cardiovascular system. Magnesium is an element, which plays a key role in maintaining proper functioning of the organism, especially around nerve-muscle and cardiovascular systems. It constitutes one of the most important intracellular cations in the organism, takes part in more than 300 enzymatic and metabolic reactions, is a calcium antagonist and has anti-inflammatory properties. Moreover, it protects from the decrease of mineral bone density and osteoporosis. The highest concentration of magnesium in intercellular fluid is found in the structures most burdened with energy expenditure, i.e. primarily in the brain, heart muscle, liver and skeletal muscles. A disturbing fact is that magnesium deficit is quite common and is considered to be one of the most frequent problems regarding deficits right after vitamin D. Cereals unfortunately are not a good source of magnesium (environmental contamination, improper soil fertilization, food processing), while products abundant in this element, such as nuts and leafy vegetables most often are not a constant element of our diet. Additionally, there are many constituents negatively influencing magnesium metabolism – hence such common deficits of this element in highly industrialized countries. The symptoms of magnesium deficiency are not characteristic and may concern many systems. Excessively low level of magnesium in the organism negatively influences the work of, among others, central nervous system and general mental well-being (depression, seizures, weaker memory and concentration, physical and mental fatigue, hyperactivity), nerve-muscle system (muscle contractions, weakness, seizures, limb numbness) and cardiovascular system (hypertension, cardiac dysfunction). Additionally, the influence of magnesium deficiency on other systems is also observed – digestive peristalsis disorders, decreased insulin sensitivity or asthma-like dyspnea. There are many factors that may have a considerable influence on excessively low level of magnesium in the organism. The main causes are definitely insufficient amount of magnesium in the diet, limited assimilability of magnesium in the digestive system as a result of the intake of foods impairing its absorption (fluorides, tannins, heavy metal salts, fiber, oxalic acid) and the increase of magnesium elimination from the organism as a consequence of taking certain drugs (diuretics, antibiotics, cytostatic drugs, oral contraceptives) or alcohol and coffee. The increase of the demand for magnesium is also observed as a result of physical effort and in the period of pregnancy and breastfeeding. Increased magnesium loss is also present in case of many ailments, such as diabetes, hyperthyroidism and kidney diseases with impaired reabsorption. An incredibly important factor of magnesium deficit is also psychological stress, which unfortunately constitutes an indispensable element of our life. Stress negatively influences the course of many processes in the organism – also those concerning magnesium. During a stressful situation, the increase of magnesium excretion with urine takes place and inactivation of magnesium ions, as a result of the activity of free fatty acids. Magnesium ions work like calcium antagonists – they reduce excessive tension and reactivity of vessels and are responsible for inhibiting the inflow of calcium to cells, which explains the appearance of hypertension as a result of magnesium deficiency. The relationship between the application of appropriate magnesium doses and reduction of blood pressure has been confirmed in many scientific studies. It has also been proven that magnesium deficiencies are not only a developmental factor of hypertension, but they also may be conducive to the appearance of atherosclerosis, heart failure and stroke. Magnesium is a microelement playing the key role in the proper functioning of the central nervous system and its improper concentration in the organism may be the cause of many mental disorders. Proper magnesium supply influences the improvement of concentration, memory and decision making as well as stabilizes the mood. Low level of magnesium in the system has been discovered in people with affective disorders. Interestingly, decreased concentration of magnesium observed during full-blown depression was reduced and restored to norm when the disease subsided. Magnesium also demonstrates a therapeutic effect – magnesium ions strengthen antidepressant effect of some drugs and show anxiolytic effect (anti-anxiety). It has been proven that magnesium deficits may contribute to the increase of insulin-resistance. It happens because this element also takes part in the process of insulin release and provides it to target places. Low level of magnesium in the system also impairs many enzymatic reactions responsible for the proper course of glucose metabolism and disturbs the activity of insulin receptors, which consequently decreases their sensitivity to insulin and may constitute one of the causes of the increase of the incidence rate of diabetes type 2 and increases the risk of the appearance of chronic diabetes complications. 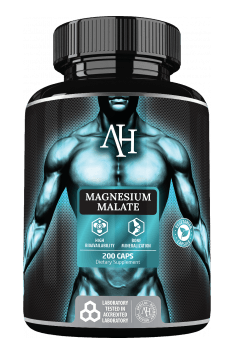 Summing up, Apollos Hegemony Magnesium Malate is a dietary supplement effectively supplementing magnesium deficits. Highly bioavailable form of magnesium malate effectively counteracts deficits of this element, eliminates fatigue, increases tolerance to stress and contributes to the improvement of the functioning of the organism and especially cardiovascular and nerve-muscle systems. Magnesium Malate 625mg 200 caps. Take 2-4 capsules daily, preferably with food. Standard daily dose of magnesium is 200-400 mg, which equals to 2-4 capsules a day. It is assumed that it is best to take magnesium during a meal, preferably in divided doses, e.g. during the main meals. The effectiveness of the preparation may be increased by combining it with vitamin B6 (pyridoxine), which facilitates the absorption of magnesium (even by 20-40%) and facilitates the transport of this element to the insides of cells and also helps to store it. A good source of vitamin B6 are leafy vegetables, avocado and nuts, but this vitamin is also available in the form of a dietary supplement. Apollo’s Hegemony is a manufacturer of dietary supplements whose composition is based on the latest scientific research and experience. The company is constantly expanding its range of products and taking care that they are of top quality. It offers formulations which have multiple effects on the body and those with more targeted effects – e.g. boosting alertness and focus, increasing the tolerance to stress, promoting peaceful sleep and maintaining the health of the liver and adrenal glands. Dietary supplements by Apollo’s Hegemony are effective owing to carefully selected composition which comprises the most potent forms and their precise doses. What is more, herbal supplements contain standardised extracts. All products of this brand comply with good manufacturing practices (GMP) and their ingredients are vegan and vegetarian friendly. It positively influences cardiovascular system; regulates general inflammatory response. Source of beta-glucans. It supports to enhance immune responses. Dietary supplement that enriches the diet with boron. It has a positive effect on the condition of bones. Supplement providing 250mg of niacin in every capsule. Does not cause "flush" effect.